To start 2016, the theaters across America have been graced with another horror film that hardly earned any expectations at all. As a month that has continually supported it’s claim as the dumping ground for horrible cinema, January starts off 2016 just as expected. The Forest, while not a good movie by any means, certainly isn’t awful either. It falls victim to a few too many clichés along the way throughout its rather interesting premise, ultimately dragging down any sort of suspense. 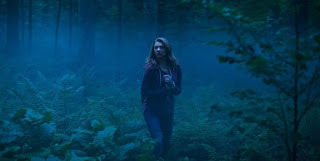 Sara Price (Natalie Dormer) travels to Japan after her twin sister disappears, determined to figure out what happened to her. The desperate Sara follows her own investigation to the Aokigahara Forest, otherwise known as the Suicide Forest, at the base of Mount Fuji. Accompanied by Aiden (Taylor Kinney) and urged to stay on the path, Sara ventures into the mysterious sea of trees only to be haunted by the tormented souls of those who never left the treacherous forest. The setting is perhaps a near perfect environment, but the story never truly takes advantage of these elements. Often abandoning any sort of dread with a reveal through jump scare and therefore lacking any real scares at all. Though interesting aspects are brought forward they’re left hanging for rather puzzling and illogical moves. The acting is about as good as it can be. Natalie Dormer gets to show a little more due to her role as two separate twins with different personalities, but the thought process behind her character is so flawed throughout that it’s hard to take anything too seriously. Kinney doesn’t have much to work worth, with such a hollow characterization that he can’t do anything too impressive, leading to a very uneven performance. The direction, by first-timer Jason Zada, of the movie is severely off track. Too many establishing shots of the forest and not enough time on the story make the film suffer to no end. And while the idea for a horror set among the real life setting of the Suicide Forest is a sound one, the execution and weak script are just not there. So what did you think of The Forest? Have you seen it and what January horror film is the worst in your eyes? Share, comment below and as always return to I Am Sam for weekly reviews.